I have a spare cushion innard requiring a cover. 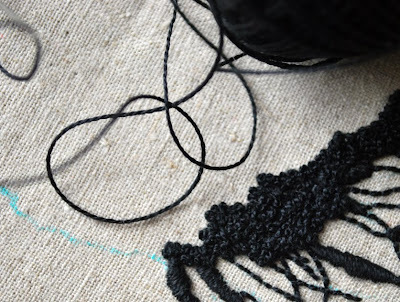 I have newly-found smitten-ness for the art of embroidery (by that I mean, I know how to do backstitch and a french knot). I have breathless, I-can’t-wait-for-the-kids-to-get-to-bed enthusiasm for the crafting of a cushion cover. With linen leftovers and an array of thread spread before me in rainbowed glory, I plotted: I connived. A tendrilled, delicate floral composition of intrinsic, detailed beauty? The tentative flutter of a butterfly wing captured mid-flight? A weather-inspired (yep, it’s still winter) piece of abstract, arty, designery whimsy? Dead Fly almost made it on to some museum graphics a couple of years ago and I’ve been hanging on to him since. There wasn’t even a need to consult the digital archives (although this could say more about a general aversion to filing and admin). I figure I am embarking on a journey* to discover the inherent beauty in the unexpected. Even if this involves an embroidered insect carcass cushioned on my couch and I’m coming over a bit weirdy-like. To navigate a billion more spaces of the creative kind, (including magnetised procrastination), go see Kirsty. I love the dead fly. It's fab. Not to everyone's taste I'm sure but I think its quirky, fun and creative. Everyone (including me) has done butterflies to death so bring on the fly, I reacon! Can't wait to see the end product. Super love the dead fly. I am only disappointed that I didn't think of it first. Hoorah for wierdy-like! love the simplicity of the design and the quirk factor, a statement piece! I'm totally with you on the french knots too. Something so completely soothing about stitching a tonne of them. I love it! There is no end to your talents! Dead Fly looks great - but Man oh Man that is going to be a lot of french knots. Methinks you may need to break out a thimble. 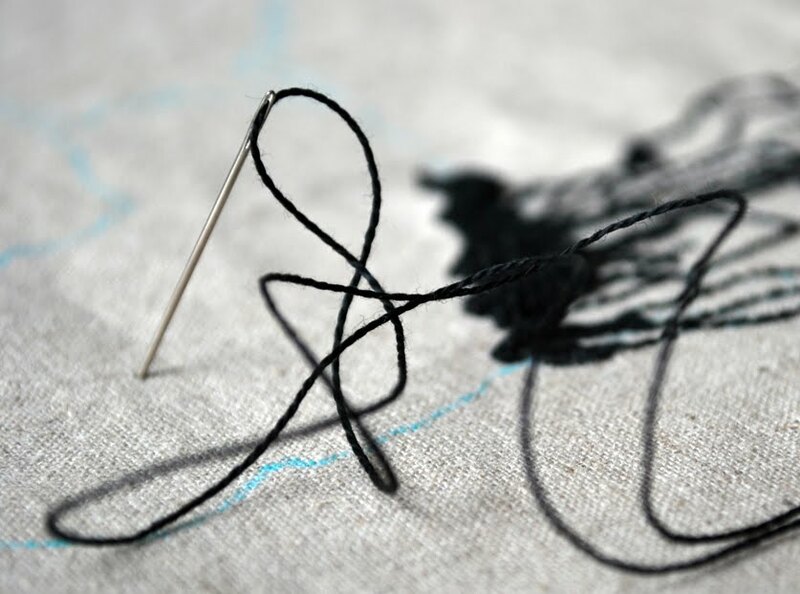 Love the first pic of the needle and thread. And dead fly is a bit creepy... how about a moderately-dopey bee instead? I love it too - it's a little bit ink-blot and a lot fly. I love it! Totally original! kinda cool in that weird Mrs T kinda way! you are amazing, looking forward to seeing your journey. Ha! 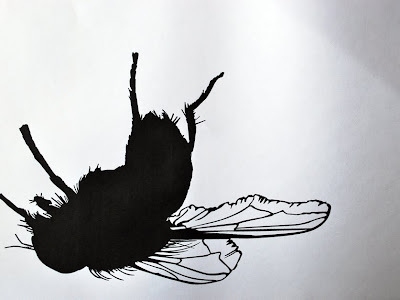 The dead fly is the bomb... can't wait to see it in all it's finished dead glory. Out of all the stitches...the frenchie is my fave. Never met anyone with more creative juices than you! Hey, if I ever want to look at a dead fly I can just check out my window runners. No need to put a great big one on a cushion at MY house. Gracious but you are a talent woman! it's gonna be a work of art my dear, I know it already! Loving it.... but then I'm beginning to suspect that we might have been separated at birth or something. Only YOU, YOU could make a dead fly look dead gorgeous! Ahhh. N will be grateful for the asterisk. I heart the fly. And you came over insane from the very beginning, so no need to cover it up. Embrace those macabre tendencies, baby! Its brilliant! Completely unexpected beauty. We put a lice under the microscope here a few days ago. Could you work that into your journey? Oh and 'gorgeous' by the way. there are just no words for my love if this dead fly. Ha! This reminded me of my Mum's cousin who visited us (in the UK) in the 80's from New Zealand. Mum and Dad took her to a disco and she lay on the floor on her back and waved her legs and arms in the air and announced it was the 'Dead Fly' dance. Strange woman. Oh and i've still not managed to master the French knot. Need lessons! love it, can't wait to see it. Bit weirdy-like you are dear. Yes, indeed. The only difference between your cushion and modern art is you aren't getting a gazillion dollar grant from an Arts Council for the doing of it. Or are you!? You should! I think I'd go to an exhibition of embroidered dead fly cushions. And all those french knots are lovely, so textural! What does Middle think of it? PS deleted previous version, cos apparently I can't spell. It's sure to "break the ice at parties"!! That is absolutely brilliant, lady. You're a star. Enjoy your journey. What a unique idea! I wonder if you'll do the spider that swallowed the fly, etc., etc., all the way up to the old lady! P.S. I just came across your second birth story, and am just amazed by your inspiringly honest retelling. I'm seven weeks post a rather traumatic birth myself, and the idea of telling my daughter about it in six years and being forgiven is wonderful. Lolling against said cushion of an evening , maybe .Putting my head on one , probably not . But I want to see it before I squeal girlishly . I know it'll be beautifully and exquisitely made ... of course I'll love it! ok...so i am totally intrigued by the dead fly embroidery project! Will you please, please post the completed project?! I am also smitten with embroidery these days. I used to embroider when I was a child...in fact my mother just gave me back my embroidery basket and my old projects were all tucked inside...a teddy bear, a rainbow with my initials...So, last winter I started to get back into it and I am hooked. To me, it is totally soothing and relaxing. I have been afraid to tell others what I am working on right now because, yes, it is a little strange...and silly...but I love it! Since you divulged your dead fly, I know that I can divulge mine...it's Sasquatch, aka Big Foot. Of course there are some pretty flowers all around him! I just love it, and I think the folk lore of Sasquatch is amusing and interesting. It's just fun. When I am finished I am going to frame it with some patchwork quilting and make it into a pillow for my bed. Do you Aussie's have the Big Foot legend in your country? snort! awesome!! i covet the pattern! The fly is wonderful . . . very zen. Is it by any chance a meditation cushion? hmmm i really don't like dead flies...i can't even look at garibaldi biscuits because they look like dead flies.